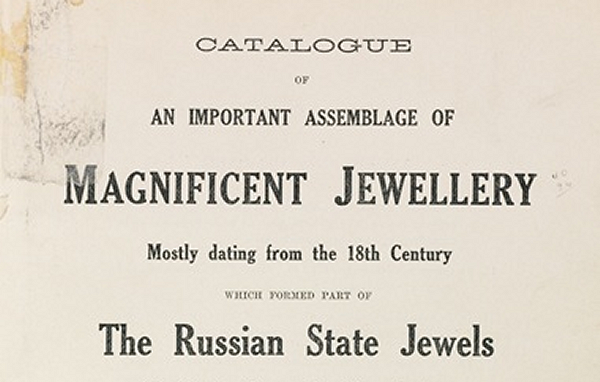 "Women Fought for Admission to Gem Auction"
LONDON, March 16 -- Women fought for admission to Christie's showrooms today to attend an auction of a collection of royal Russian jewels including the famous nuptial crown of Catherine the Great . The gems brought a total of £80,561, or almost $400,000. The nuptial crown, as it is described to distinguish it from the great imperial coronation crown, was sold early to a Paris firm for £6,100. It has double rows of fine brilliants set in borders of smaller stones and surmounted by a cross of six large brilliants. 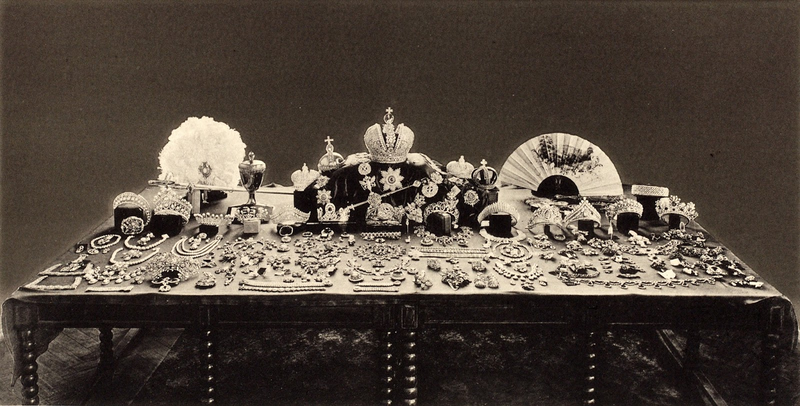 Necklaces, tiaras, pendants, bracelets, gold goblets and a jewel-encrusted court sword of Paul I  -- all jewels worn by the rulers and nobility of Imperial Russia -- bought recently by an English syndicate, were sold in 124 lots to close a partnership account. The glittering treasures holding so many romantic and tragic associations were taken from a secret underground storeroom where they had been guarded night and day, only a few minutes before the sale. So eager was the crowd at the showrooms, mostly women, to see the unprecedented array of diamonds on auction, that the doors of Christie's had to be closed. The largest stone of the collection, the Polar Star , a fifty-carat diamond which is said to have ranked third among the great Russian gems, brought £11,800, which was the record for a single brilliant. A pair of diamond bracelets brought £3,400; a diamond brooch with sapphires and pearls, £7,500; a pendant, £4,300; a tiara, £4,200 ; a jasper snuffbox, £2,600; a pair of diamond pendants, £2,500; a set of diamond buttons, dating from 1764, £2,550; and a court sword, £1,700. Most of the jewels dated from the 18th Century and were made by French and Russian craftsmen during the reigns of the Empresses Elizabeth  and Catherine the Second. Many of them were used down to a late date in ceremonial functions of the Russian Imperial Court, although none of them was the personal property of the family of the late Czar . 1. Empress Catherine II of Russia (1729-1796) is better known to history as Catherine the Great. Born Princess Sophie of Anhalt, she married the future Emperor Peter III of Russia in 1745. Many believe she was instrumental in engineering the 1762 coup that deposed her husband and placed her on the imperial throne. 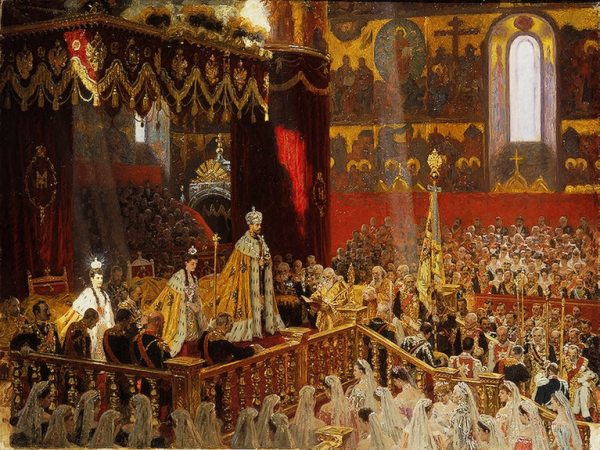 Her subsequent reign was celebrated as a golden age for imperial Russia. Even so, the nuptial crown auctioned in 1927 didn't belong to Catherine; it was made in the nineteenth century, years after her death. 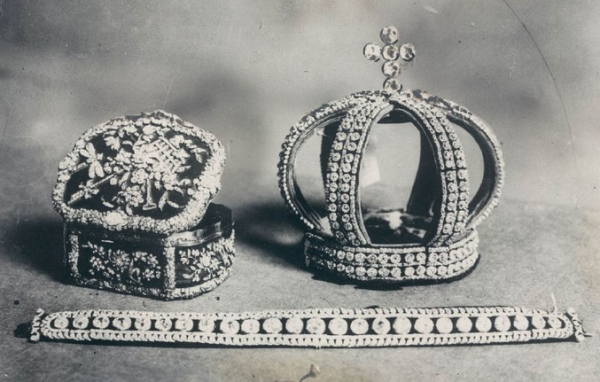 However, at least some of the diamonds set in the nuptial crown reportedly came from Catherine's collection. The Nuptial Crown was eventually acquired by Marjorie Merriweather Post, and today it is part of the collection at Hillwood Museum in Washington, D.C.
2. Emperor Paul I of Russia (1745-1801) was the only son of Peter III and Catherine II. His reign lasted only five years, but during that period he established the Pauline Laws, the laws of succession to the imperial throne of Russia that were followed until the end of the Romanov dynasty in 1918. He was 46 when he was assassinated by a group of military officers. 3. The Polar Star, a 41.28 carat colorless diamond, was mined at the famous Golconda mines in India. It belonged to Joseph Bonaparte, brother of Napoleon, before eventually passing into the collection of the Youssoupov family. Cartier bought the diamond in the 1920s (though I'm not sure whether they were the purchasers at this auction) on behalf of Lady Deterding, wife of a Dutch oil baron. In 1980, the diamond was sold again at Christie's in Geneva, where it was purchased by an anonymous collector from Mumbai for $4.6 million. 4. 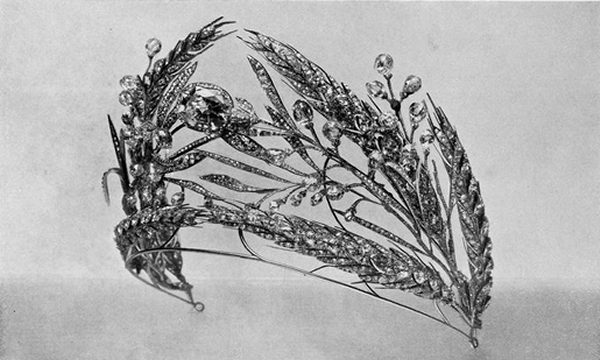 The Russian Field Tiara, a gorgeous diadem featuring ears of wheat, plus laurel and oak leaves, in its design. The naturalistic tiara was made for Empress Maria Feodorovna (1759-1828), the second wife of Emperor Paul I (and, therefore, daughter-in-law of Catherine the Great). A replica of the tiara is on display today at the Kremlin. 5. Empress Elizabeth of Russia (1709-1762), daughter of Peter I (better known as Peter the Great) and Catherine I, reigned in Russia from 1741 until her death in 1762. She seized power at the age of 33. Because she never married or had children of her own, she designated her nephew, the future Peter III, as her heir; she also hand-picked his spouse, the future Catherine the Great, to help secure the future of the dynasty. 6. Emperor Nicholas II (1868-1918), the last Romanov tsar of Russia, reigned from his father's death in 1894 until 1917, when he was compelled to abdicate the throne. He and his entire family were assassinated in 1918 -- a hundred years ago tomorrow.